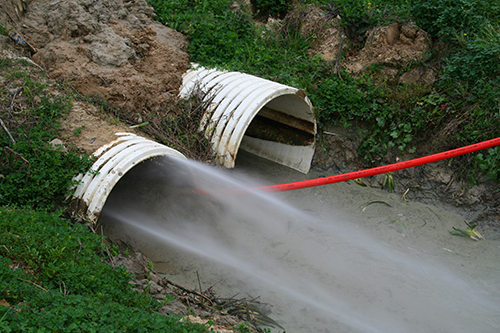 Hydro-blasting is an industrial cleaning process utilizing high-pressure water. It is one of the most common industrial cleaning processes used in industry today. Hydro-blasting will extend the life of equipment and increase process efficiency resulting in lower operating costs. We have a fleet of hydro-blasting equipment ranging from 3,000psi to 40,000psi and at various flow rates. To properly clean utilizing hydro-blasting equipment, you must have a good understanding of how flow rates affect water pressure on hydro-blast equipment. We do! Our management team and skilled supervisors discuss projects to make sure we are utilizing our equipment efficiently and providing the best cleaning service to our customers. Part of this process also includes selecting the right cleaning tips and nozzles based on the particular needs of the project. We also have automated options for hydro-blasting. Automated cleaning is becoming more and more popular and has many advantages. Some of the values of automation are fewer crew members. Employees are “hands-free,” more efficient, and consistent when using high-pressure equipment for cleaning; which means no need for breaks, or downtime due to physical fatigue. Automated cleaning enables more consistent controlled cleaning, multiple lance packages and less chance for missing areas or tubes while cleaning, which reduces cleaning times. Anytime high-pressure water is being used, safety is of the utmost importance. With one of the best maintenance programs around we constantly inspect equipment and perform preventative maintenance to make sure equipment is in top working order. Our supervisors and operators are trained on hydro-blasting safety and are GBRIA or NCCER Hydro-Blast Certified. At Master Vac, we are committed to safety and to providing a safe work environment for our employees and our customers.